This weeks pick reveals another issue of the Marvel Universe. #6 or K_M to be specific. Looks like I did a couple pages here: Kro and Magneto. Of the others, I’ve already done Kang, Klaw, Kraven, and the Lizard... let’s go with Loki. As long as we’re not on the subject... After Spider-Man throwing the Hudson River off his back in ASM #33, I’ve always thought the two most powerful shots in Marvel history were Big John Buscema’s Loki on his throne and Conan sitting on a log. Neither one doing anything other than sitting and looking at you. It was a lesson in character, that the threat can be scarier than the deed. 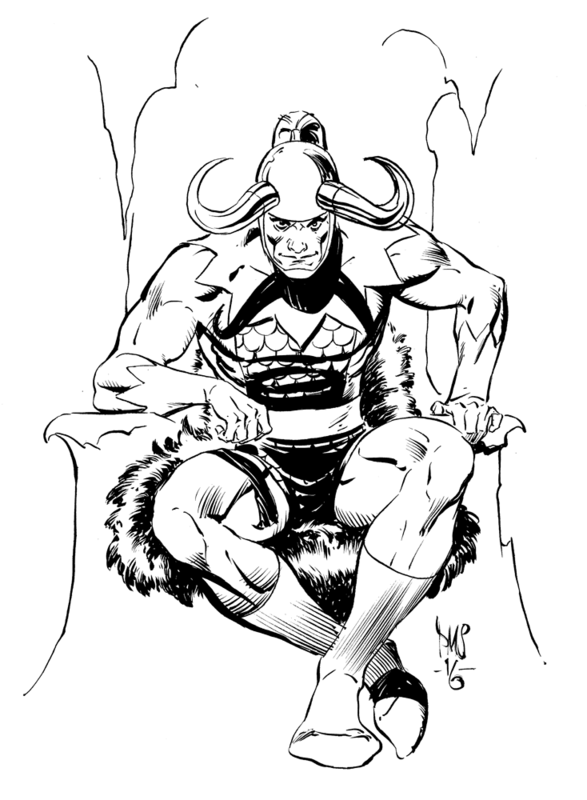 John Buscema's Loki-on-throne from Silver Surfer #4 immediately came to mind when I saw this piece -- and that's meant as high praise, as I consider that issue to be one of the most beautifully pencilled (and inked, by brother Sal) comics in Marvel history!